The townland is the smallest administrative territorial unit in Ireland, varying in size from a single acre to over 7,000 acres. 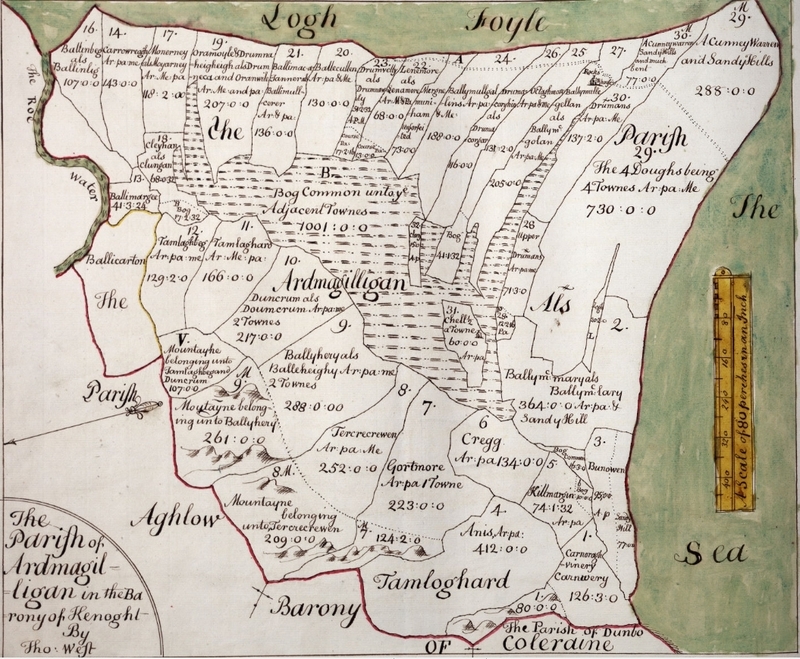 Originating in the older Gaelic dispensation, townlands were used as the basis for British administration in Ireland and of leases in the estate system, and subsequently to assess valuations and tithes in the nineteenth century. 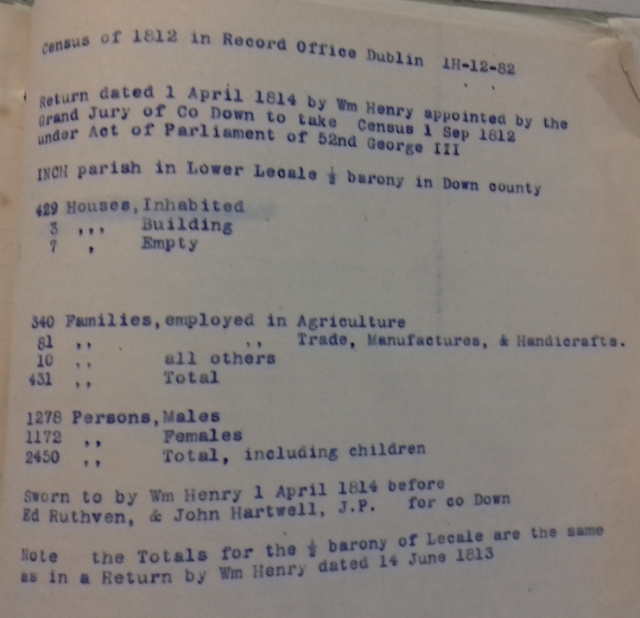 The townland remained the basic recording unit within the census returns before 1911. There are over 60,000 townlands in Ireland (almost 17,000 of these are in Ulster). 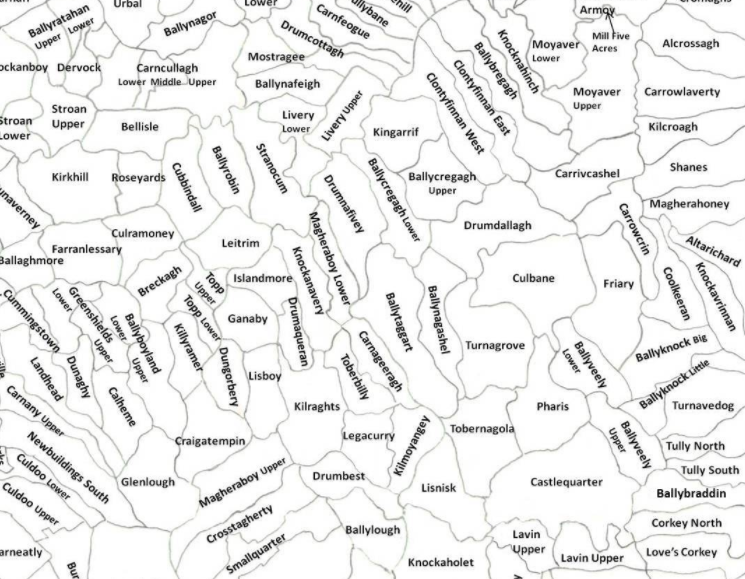 Ireland then is made up of a gigantic jigsaw puzzle of townlands, each one unique and a visible sign of our topographical and genealogical history. Townlands are of ancient origin an identifiable marker of both landscape and history. Townlands were used in the British system of administration during the Ulster plantation. Unfortunately, some if not many of the Gaelic names were written phonetically and anglicized further through the centuries making it difficult to determine the original meaning of the townland. 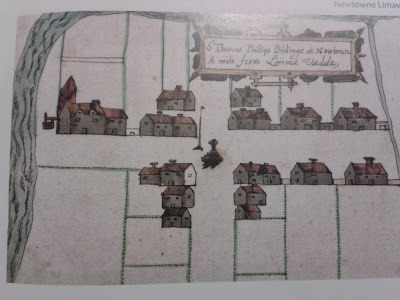 The Down survey maps created in the period 1656-1658 in order to measure all of the land forfeited by the Catholic Irish to facilitate redistribution to merchant adventurers and military personnel used townland denomination as the basic unit to facilitate the transfer of lands. The survey was the most advanced of its time and remarkably accurate. Some townland names have disappeared into the mists of time or as new land was reclaimed from forest and bog new names were created. 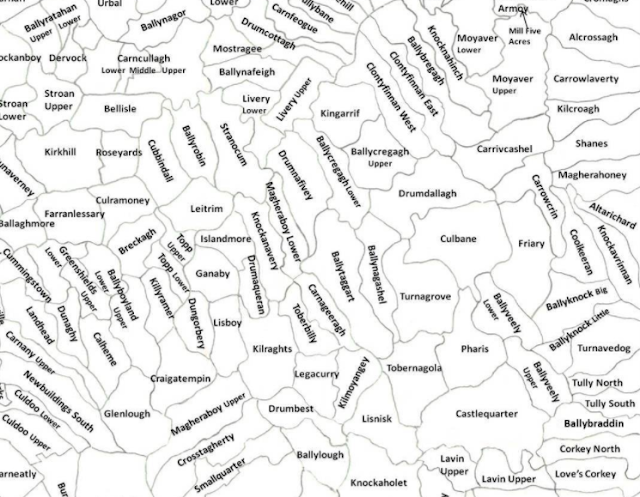 Often townland names changed over time. Townland of origin is of vital concern in tracing family history in Ireland. Often families lived in the same location for generations. Since townland was an administrative division then civil government made use of these in the various surveys and censuses carried out over time from the 17th to the 20th century. The family can be found in the contiguous townlands of Bovevagh, Bonnanaboigh and Ardinarive from the hearth returns of 1663 through to the 1831 census. By searching the available census substitutes we can see that the family were clustered in one area of the parish and there is a clear line of descent although no formal family tree can be produced from this raw data. Without too much research we have identified the core of the family from 1663-1831 well established in the parish of Bovevagh. 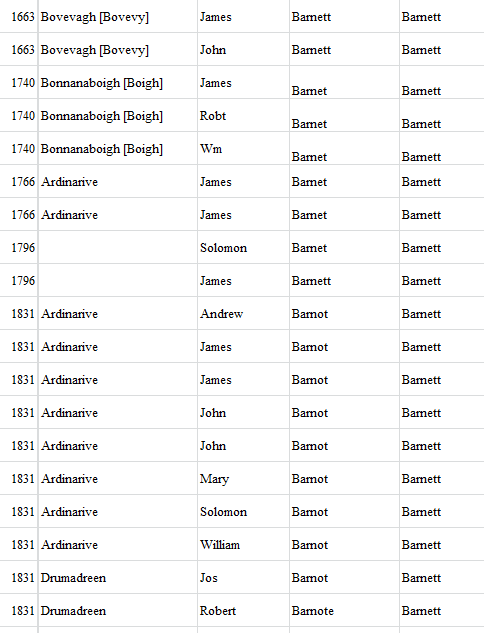 The progenitors of the family in the parish appear to have been James and John Barnett both paying hearth tax in 1663. These names carry down through the family line with additional names such as William, Robert, Andrew and Solomon becoming identifiable markers for the family. 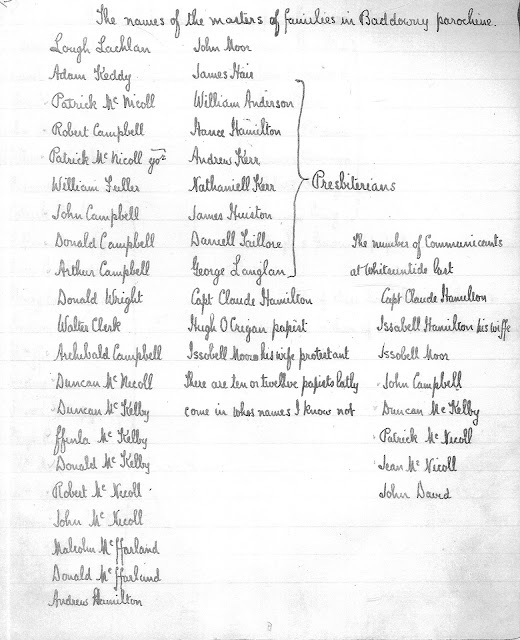 The identification of townland or townlands for the Barnett family opens up the possibility for further research, especially in land records such as estate papers and the registry of deeds. It is the townland and parish that opens up paths for further research - not the surname. We must bear in mind that the townland of Ardinarive had different spellings in the records with Ardinariff being just one of the more common variants. Key to unlocking the sources for the townland is identifying the landlord. Griffith's valuation is a useful tool in this regard. In 1858 the landlord for Ardinarive was James Douglas. We can see that he was the landlord for Andrew, William, James and John Barnett. 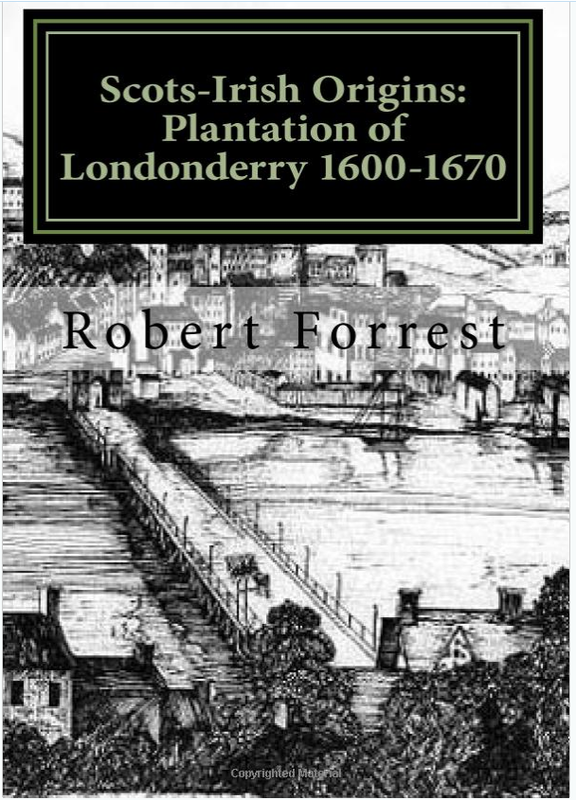 Ardinarive (as well as Bonnanaboigh) was actually Churchland under the See of Derry so Douglas was only chief tenant and sub-leased the land to under-tenants. The search for records for the Derry (bishopric of) estate might through additional light on James Douglas and his lease. I would also consider searching for information on James Douglas the landlord in 1858 as this again might through additional light on the townland of Ardinarive. The family was in Bovevagh townland in the parish of Bovevagh in 1663. At that time Bovevagh was part of the Phillips' estate in Limavady and some early records for this exist in the Public Record Office in Belfast. Locating townland of origin is a key priority in Irish research as location is central to unlocking the sources that potentially reveal more about the family under investigation.